An email from Fr Victor Patapov, executive director of the Fund for Assistance. On Friday, March 5, 2010 at 8:00 PM at St. Sophia Greek Orthodox Cathedral in Washington, DC, Fr. Gregoire Legouté of Port-au-Prince and his wife Rose will give eyewitness accounts of the hardships Orthodox Christians in Haiti are facing as a result of the violent earthquake that devastated their poor Caribbean nation. The Orthodox Mission in Haiti consists of 5 parishes and 2 chapels with about 2,000 Orthodox Christians lead by two priests Fr. Jean Chenier-Dumais, and Fr. Gregoire Legouté. Both priests survived the earthquake and are doing all they can to rebuild the Mission. There is no social support system in Haiti, so all social work is done by the Church. The Church communities use rented buildings so they have no church home of their own and the priests were forced to travel many miles in a car they shared in order to visit their parishioners. This car was destroyed in the earthquake. The Mission was struggling before the devastating earthquake and now has found itself in a situation worse beyond imagining. Even before the earthquake Fr. Gregoire in a recent interview declared, "We lack everything in Haiti. We don’t have liturgical books, sacramental vessels, land to build a church, or money for our schools." The needs of our Orthodox brothers and sisters in Haiti are now greater than ever. To learn more Fr. Gregoire and his wife will speak again at the Russian Orthodox Cathedral of St. John the Baptist on March 7th at 9:30 AM after Sunday English liturgy. You are cordially invited to both events, to hear about the struggles of our fellow Orthodox Christians at the frontlines of our Church. Fr Gregoire Bishop Michael, Fr Jean in St Moses chapel, before the earthquake. Just received from our Diocesan secretary regarding donations to Haiti. ROCOR Sts. Peter & Paul parish in Leogane was totally destroyed in the earthquake. As promised in the letter of 4/17 January, 2010 this letter contains specific details regarding collections for those suffering in Haiti which you have been conducting in your parishes since the time of the serious earthquake there on January 12. Checks should be made out to the Diocese of Chicago & Mid-America with a notation in the memo section: “Haiti Relief”. The Diocesan Treasurer will record all checks and send the entirety of the funds to the Fund for Assistance. Thank you for your kind support of the suffering in Haiti! I have just returned from a week in Haiti following the disastrous earthquake on Jan 12. The condition of the mission in Haiti, along with the population at large, is dire beyond all imagination. While there, I visited three parishes of the Russian Orthodox Church, meeting with the faithful and assessing their needs. I travelled with a paramedic/medical officer from Belfast, Ireland (Lars Stuewe) who was able to treat approximately 50 sick and wounded, including many of our parishioners. There are so many concerns that I hardly know where to begin, but I will mention a few of the issues I believe to be most pressing. Much of the population, including many of the members or our parishes, have limited or no access to food and water, or cannot afford the food and water available. Sanitation is practically non-existent throughout the country. While provisions and medical attention are in abundance in some areas, others are reported to have received so far only 10% of what is needed. Our mission could greatly aid our parishes and the people of Haiti by addressing these needs. For example, the mission could establish food distribution networks and, especially, water purification centers. Proper sanitation also needs to be established at locations accessible to the members of our parishes. Shelter is an extreme concern that should be addressed promptly, as the general health of the population, including our own parishioners, will degrade drastically once the rainy season begins in a few months. This is especially true in Leogane, where the houses occupied by the parishioners were completely destroyed and the entire parish is living in an outdoor camp. One of the parishioners owns the parcel of land where these houses stood and where the camp is now located. If usage of this land could be obtained by the mission (by purchase or lease), an apartment building sufficient to house the entire parish could be built. I have spoken with an accomplished general contractor who is prepared to spend considerable time in Haiti overseeing this or any other construction projects. Three parishes (in Port-au-Prince, Leogane, and Jacmel) were directly affected by the earthquake. In Port-au-Prince the church is badly damaged and must be repaired or replaced before it is safe to resume services in the building. In Leogane the church (a rented building) was completely destroyed. In Jacmel the rented building does not appear to have been damaged. As mentioned above, there is a general contractor prepared to aid the mission in repairing or constructing the church buildings in Haiti. The school operated by Fr Jean Chenier-Dumais was completely destroyed along with his home and vehicle. I am not certain who owns this land, but if it is owned by Fr Jean or the mission, the building will need to be rebuilt. Otherwise I believe it most advisable to purchase land and rebuild the school there. In addition to the needs of Fr Jean’s school, I became acquainted with the director of a school that provides a high standard of education to some 300 students. He has thus far operated the school with no outside funds, but he no longer has a building (it was destroyed) and is unable to pay the teachers’ meager salaries. He was previously paying the teachers by himself taking side jobs as an interpreter. This is not an immediate need on the same level as some of the other concerns presented here, but it is my hope that the mission could take over this school’s activities, thus providing critical education at a time when 90% of Port-au-Prince’s schools have been destroyed. The funds needed for this project are not extreme and the benefits to the community would be great. I realize that I have raised many concerns and provided few solutions. The funds needed to properly re-establish our mission and provide for the future health is staggering, but the need is immediate. I call upon all the faithful to contribute generously to the needs of the mission and people in Haiti. Donations can be made through the Fund for Assistance to the Russian Orthodox Church Outside of Russia (www.fundforassistance.org). Please remember Rdr. Vladimir from the parish of the Nativity in Port au Prince. He taught at a private school in the city that was destroyed in the quake. He never returned home… Remember his widow, Madeline, and two children, Ester and Sebastian. They are devastated. Fr. M. will stay until after the funeral in the a.m. There are many from the parish that are still unaccounted for… Lord have mercy!!! Fr. M. is on his way back to the Dom. Rep. this evening. I’m certain that it must be very difficult to leave the people there. I can only imagine how frustrating it must be, feeling as if he should have accomplished so much more in a week. Unfortunately though, he has to keep his job(s) here at home! Please pray for him. He hopes to be home Monday. I arrived in the Dominican Republic on Friday, Jan 15, determined to provide as much aid to Haiti as possible. At the time that I left the US, we had received no word from the clergy in Haiti. Thank God, while I was en route to Haiti, we received word that the clergy were alive and in good health and that there were no confirmed fatalities among the parishioners. Due to many complications, it was only Monday when I arrived in Port-au-prince, by which time I had been joined by a German medical officer, Lars Stuewe, who practices medicine in Belfast Ireland. After some discussion of the obvious need, he decided that he would like to work with our Mission to provide medical attention to our parishioners and the surrounding communities. We arrived late Monday night, driving through large areas that had been destroyed to such an extent that no one remained in those places. Other places, large groups of people would be gathered in outdoor camps, sleeping on the ground without shelter. Fr Gregoire` and some of the the faithful (before the earthquake). On Tuesday, the feast of Theophany, we opened a small clinic near Fr. Gregoire`s home, where we were able to treat 42 patients with medical supplies purchased by FFA that we brought with us from the DR. A few patients were treated after dark, with stitches being performed by flashlight. Careful records were kept for every patient and health cards were issued to help reduce the risk of duplicated health care. Twenty patients were referred to the hospital due to injuries that we did not have materials or equipment to treat. Unfortunately, the situation with the hospitals appears dire, as we were finding that patients with complicated fractures were being turned away from the hospitals due to lack of space. However, the need for a more significant clinic at Fr. Gregoire`s home in Fontamara appeared limited, and we determined to assess the situation in other areas, including Jacmel. At that time there was news that no aid had yet arrived in Jacmel, a city of 110,000. While Lars was treating the patients, I made initial contacts at the United Nations and the World Health Organization (WHO) and learned that the UN assessment of public health would only begin assessments of the situation on the ground on Friday, Jan. 22. On Wednesday morning we were awakened by a second quake measured at 6.1. The house we were in was undamaged, but other houses in the area were seriously damaged. After resolving numerous logistical issues, we began the long and arduous task of locating the WHO medical supply warehouse. The medical director and pharmacist were very supportive and issued the required drugs and medications after verifying our charity status and practitioners license. We received adequate medical supplies to treat 1000 patients. Further medical supplies can be obtained now as needed. Immediately we headed toward Jacmel from whence we had received word that 30 members of the parish of St Augustine were sick and wounded. By this time we had also learned that the Canadian military was on site in Jacmel, but were unable to determine what, if any, aid they were providing. Arriving in Jacmel late in the evening, we immediately began the task of assessing the situation here. Everywhere we went, we received contradictory reports or even total lack of knowledge of the situation. On the one hand, we repeatedly heard report of 2,000 fatalities, yet at the hospital there were only 83 patients. The senior house officer (SHO) there reports that he is the medical officer in charge and has 17 more medical staff. However, they have no X-Ray film and no orthopedic surgeon. Therefore they cannot provide any bone surgery at that hospital. They were assessed several times by various organizations, but have received no medical supplies and is running short of antibiotics and pain relieve such as morphine, etc. They have received food and water from the World Food Program (WFP). At the Police station no useful information could be obtained at all — not even the population of the city. At the Canadian base, the situation was similar — they were not even aware of whether they were providing any medical care to the area. Our last visit on Wednesday was to the football field where an IDP camp has been set up and appears to be housing approximately 800 families. There we learned that medical treatment was being provided by Canadian doctors. Which organization they are from and what type of treatment they are providing is yet to be determined, as the local representative of the United Nations did not know the answers to these questions. I have experience in Emergency Medicine and Pre-Hospital Care. I graduated in 2003 in Germany with a BSc in Medicine and Anaesthesia. After my internship I served as an Officer to the Olympic Games in Athens as a Teamleader in the HOC and OLV. After the Tsunami I was deployed by the German Medical NGO EMT International Aid to Sri Lanka (Trincomalee) in the early days with a response team. We provided Emergency Response in affiliation with the catholic church . We treated more than 5000 patients initially. For the long term we built a Medical Centre in the Holy Cross Grounds (caritas funding), During the building period I provided Medical Aid to the public and the international community. In the rising violence and full scale of war, I was appointed UN-MEDEVAC leader. I was acting Chief for the Field Hospital in Kantale during the defense action on Mutur district. I have the expertise to deal on all kinds of Trauma and Tropical diseases. I am familiar with Primary Care and Minor surgical procedures in difficult environments. The situation in Haiti is worse than expected. Due to no coordination, lack in communication and planning, the situation is extremely difficult to find the right location to set up treatment to avoid duplication. I recommend a long term project. In what way it has to be determined. Initially I see importance to help the suffering and injured people wherever help is needed. I will attempt to prepare a rough proposal as to the cost of such a project as soon as possible. In Port-au-prince, the Church of the Nativity of the Virgin is still standing but damaged. One reader, Vladimir, is missing and cannot be located. There are no confirmed casualties in the parish. The school operated by Fr. Jean was completely destroyed, along with his home and vehicle. At Fontamara, Fr Gregoire`s home withstood both quakes, but the chapel of St Moses sustained some damage. The school operated by Fr Gregoire is damages as well. At Jacmel the house where services are held is standing without damage. About 30 of the parishioners are injured, with three admitted to the hospital. At Leogogne, the Church of Sts Peter and Paul and many houses were destroyed, but no details regarding the situation of the faithful is available. The parishes in Cayes, Cap Haitien, and Maissade were unaffected. Later today I will meet with an organization (I don`t have the exact name) that is working with IOCC. They are receiving a container today from IOCC with aid for the parishes. In summary, the situation is very complicated and chaotic. Even within our parishes, We are determined to provide aid to the faithful and to the population at large. I will continue to report on our activity. Please pray for all of us here. Fr. Matthew Williams informed us that the church building of our ROCOR Sts. Peter & Paul parish in Leogane was totally destroyed in the earthquake. He also visited the parish in Jacmel. The situation there is not too bad. 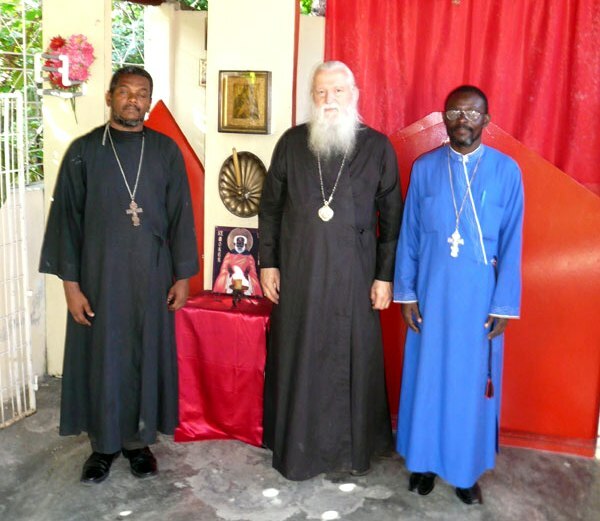 If any of our clergy would consider going to Haiti to help with pastoral care for a three-week stay, International Orthodox Christian Charities (IOCC) has a training program and would welcome our help. You are currently browsing the archives for the Haiti category.